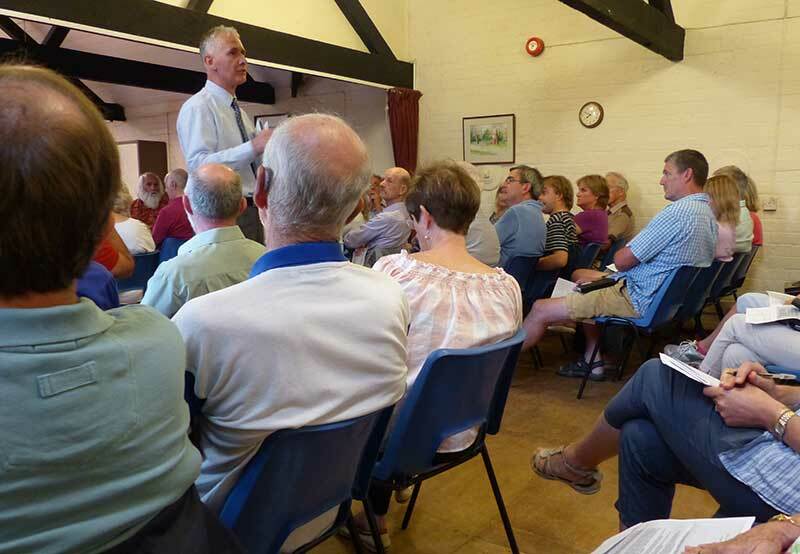 'The Friends of the Commons of Malvern' is a Residents' Association, formed at a meeting, attended by about 100 people, at Guarlford Village Hall, on the 8th August 2018. Sometimes referred to by the abbreviation FoCoM which is easy to remember! The objects of the Association are to promote and protect the character of the lowland commons east of the Malvern Hills. Contact us if you would like to be placed on our mailing list, or wish to raise a matter of concern. Our logo is shown opposite. The Friends of the Commons of Malvern have a Facebook page where you can place comments. The Board of the Malvern Hills Trust met at the Gryphon Room, Malvern College, Thirlstane Road, on 19th March 2019 to decide the Chance Lane Easement application by the Rose Farm Partnertship (RFP). The partners were named as Martin, Emma, Doreen and Mark Wilesmith. About 150 members of ther public attended the meeting filling the hall. At the start of the meeting there was a discussion about whether any member of the Board had a conflict of interest. Then the applicant and members of the public were invited to speak. The RFP did not send a representative. Mr Mike Huskinson, Dr Graeme Crisp, Katharine Harris, Angus McCulloch, Clive Smith (a past chairman of the Board) and John Watts spoke for refusal. Public questions were asked reflecting several important matters that should be clarified before any decision was taken. A presentation about the application was given by the officers to Board members and a strenuous debate followed. Board members were reluctant to approve the application because of the lack of information about the impact on the Malvern Hills and Commons. Concern was also expressed about possible Reputational damage to the Trust. After a lengthy debate the application was refused unanimously except for one abstention. During the meeting it emerged that the RFP had submitted an application to the SWDP Review offering Rose Farm for development, on 12th December 2018. In this it was stated that an Easement had been negotiated with the MHT; this was incorrect and this misrepresentation may now result in this parcel of land not being considered further by the South Worcestershire Development Plan Review. Many thanks to members of the Residents' Association and other supporters for attending the meeting. Thank you also to members of the Board of the Trust for continuing to protect this attractive gateway to Malvern. The Special Board meeting to discuss the controversial Chance Lane Easement, twice postponed, has been rearranged for Tuesday 19th March 2019. Please do come along to this very important meeting to show your support for refusing this application to build a large access road across the common adjoining the Guarlford Road, and bring your friends. Directions: from Court Road turn into Thirlstane Road, proceed under railway bridge and immediately turn right for the Gryphon Room and Sports Complex. The special meeting of the Trust postponed from 20th November 2018 and provisionally rescheduled for 28th February 2019 has been further postponed as the Trust is still waiting for further legal advice in response to matters raised by precept-payers. The Trust hopes to announce a new date no later than the next Board meeting on Thursday 14th March 2019. The Trust has provisionally arranged for the postponed meeting to decide the Chance Lane Easement to be held on 28th February, in the main hall of the Chase High School at 7 pm, subject to receiving advice from their lawyer which is still awaited; this probably relates to legal matters raised by residents last November. On a dry frosty evening residents gathered on the common beside Chance Lane to sing Christmas carols accompanied by members of Single Reed playing saxophones and other instruments, while hot mulled wine and mince pies were served. A community event much enjoyed! 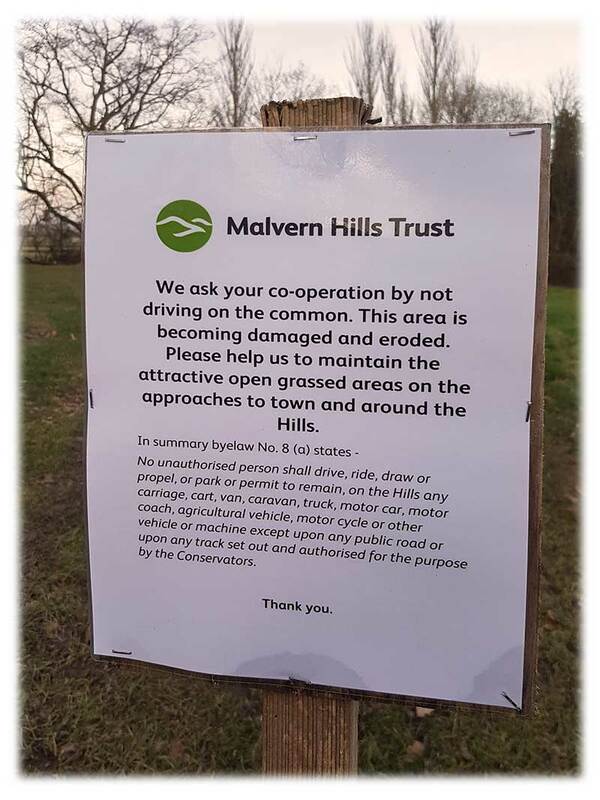 The Malvern Hills Trust announced on 15th November that the special meeting on 20th November has had to be postponed due to unforeseen circumstances. The Malvern Hills Trust announced at the Annual Board meeting on 8th November that the special meeting to decide the Chance Lane and Jackpit Lane easements would be on Tuesday 20th November at 7:00 pm in the 'cricket pavilion' next to the Council Offices otherwise known as The Council Chamber, Priory Lodge. A copy of the MHT papers and the applicant's submission can be obtained from the reception desk at the MHT office in Grange Road. In due course the MHT plans to place a copy of the papers on their website. It used to be that the whole of the Malvern Hills and Commons were protected for the benefit of the public by the Malvern Hills Conservators, who have rebadged themselves as the Malvern Hills Trust, with a view to obtaining increased revenue. Currently the Trust is largely funded by a precept levied on those who pay Council Tax and income from the car parks on the Malvern Hills; there is also believed to be some income from the EU which could be lost as a result of BREXIT. Early in 2017 residents became aware that a body calling itself the Rose Farm Partnership was seeking an Easement from the Trust for permission to build a wide access road across the common from Chance Lane into the field known as Rose Farm, in order to build a large housing estate. The field, which lies opposite the Green Dragon pub, is of about 25 acres so a developer would likely want to build between 300 and 500 homes. A second Easement crossing Jackpit Lane into Hall Green Close was also being sought for an 'emergency access', despite Hall Green Close residents owning a 'ransom' strip on the north side of the lane. Rose Farm is not however currently earmarked for development in the South Worcestershire Development Plan (SWDP) or the Malvern Town Neighbourhood Plan and the majority of town officials and residents are keen to preserve this beautiful gateway to Malvern. Housing needs are being met by a large development at Newland (800 homes) and at the old RSRE South Site (314 homes). The tone of a letter delivered to seven or so properties adjoining the land in July 2018 gave precept payers the impression that officers of the Trust were leaning towards granting the Easement - tempted by a formula which the Trust believes could benefit them by up to one third of the uplift in the value of the land, were the field to be developed. Most recently a sum of at least £2M has been mentioned. Residents, the Malvern Town Council, and Malvern Civic Society were not happy about this. 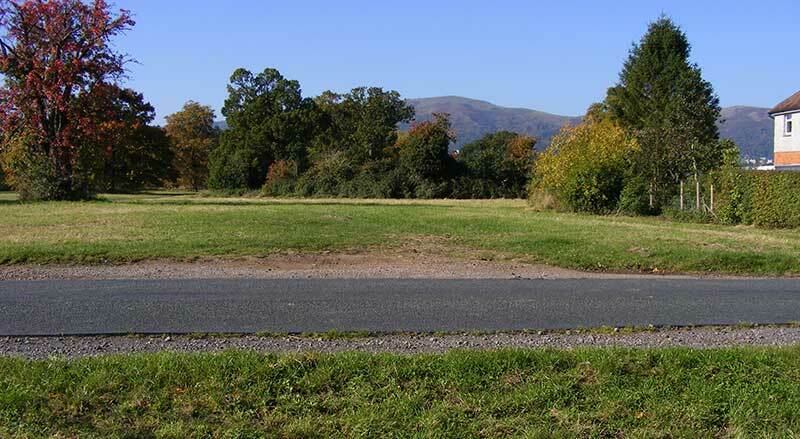 It is ironic that the Malvern Hills Trust asks us to protect the attractive approaches to Malvern (see photo opposite) whilst themselves considering plans that could damage the beautiful approach from Guarlford to Barnards Green. Below is a timeline, with latest events at the top, outlining the debate that has been taking place. The Trust holds Special meeting to discuss the Chance Lane Easement. 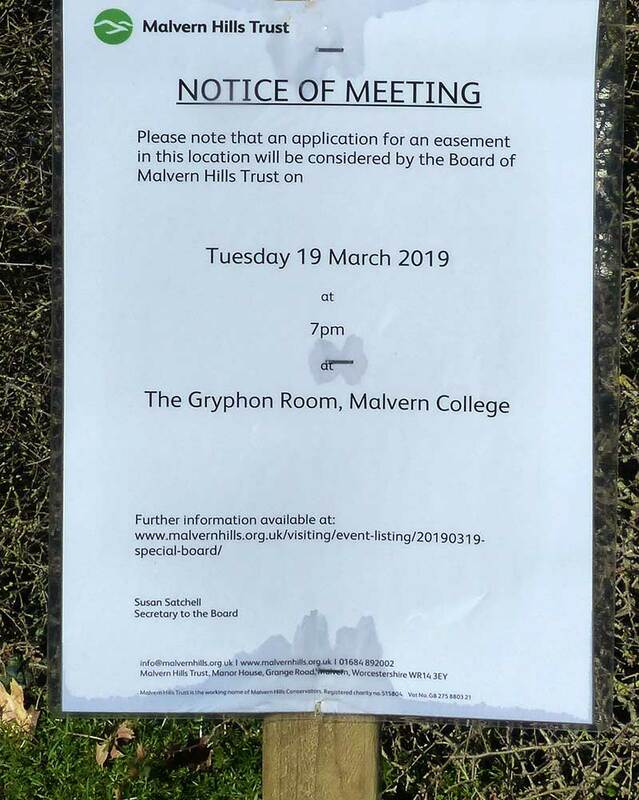 The Trust announces that the Special Board Meeting to discuss the Chance Lane Easement has been rearranged for Tuesday 19th March in the Gryphon Room, Malvern College, starting at 7 pm. The Trust announces that the Special Board Meeting to decide the 'Chance Lane' Easement has been further postponed as still waiting for legal advice. Malvern Hills Trust announce the Special Board Meeting on 20th November 2018 has been postponed due to unforeseen circumstances - legal points raised by residents, to which the Trust will seek Counsel's opinion. Malvern Hills Trust advise at the Annual meeting of the Board that the special meeting to consider the Chance Lane (Rose Farm) Easements will be on 20th November 2018. Residents will be able to ask questions submitted before noon on Friday 16th November, and it is expected a spokesman for the residents will be able to address the meeting. Many residents were surprised by what happened at the Land Management Meeting to discuss the proposed new easement policy. The meeting began at 7pm, but discussion of the policy (agenda item 10) was not reached until well over two hours later! Residents couldn't believe their ears, as an hour was spent discussing two easements, which had earlier been refused and returned to the Committee on appeal; there was a lot of debate as to whether they should have asphalt or a composite surface and who would be responsible for maintenance. There then followed an item about feral Wild Boar, which have not appeared the Hills yet, but could migrate to the hills from the woods of Gloucestershire. Residents were naturally annoyed when less than 20 minutes were spent on the draft Easement Policy. None of the Trustees that had been lobbied raised the questions that had been put to them, although the committee voted to take out one section dealing with appeals for further consideration. To our surprise the issue went straight to a vote on the Resolution - with about seven votes in favour and one abstention the new Policy was recommended for acceptance by the whole Board at their next meeting. The Trust had said that the reason for the changes being made were prompted by the Chance Lane easement application. However, few links were made with Chance Lane and the sensitive issue of income possibly outweighing conservation was ignored. A Friends of the Commons of Malvern member, concerned how little time had been spent looking at the policy, stood up to ask how what had been discussed was relevant to Chance Lane, wanting to make a short statement. But she was not allowed to speak further or ask questions, though was invited to write to the Chair of the Land Management Committe with concerns. The CEO of the Malvern Hills Trust had said in a letter to Harriett Baldwin MP that 'the Chance Lane Easement application is in no way unique nor unprecedented'. However the Malvern Hills Trust now blatantly proposes to amend their Easement Policy purely in the light of the Chance Lane Easement application, presumably in order to justify granting the easement. See paper C to be tabled at the next Land Management Committee on Thursday 11th October - here is the link. The key changes are the possibility of consideration by the Land Management Committee being bypassed, and less emphasis on reputational damage. The contentious paragraph about balancing the money offered in return for granting an easement against detriment to the Malvern Hills and commons is retained in a slightly different form. Neighbourhood Plan available for viewing at the Malvern Town Council Office on Belle Vue Terrace between 5 pm and 7 pm. Do go along and support your Town Council and have your say. Friends of the Commons 'rally' at the Wocestershire Beacon. Facebook 'About Us' updated amplifying residents objections to the proposed road across the common. Malvern Town Council's Your Neighbourhood Plan publicised in the Malvern Gazette. The Neighbourhood Plan flags the beautiful approach to Malvern from Guarlford as an area to be preserved. With this in mind the Malvern Hills Trust should not be approving a road across the common for a possible housing estate. The Friends of the Commons tabled a number of questions and attended the Board meeting. The Chairman of the MHT presented the questions as a list on a slide and reeled of replies in about 7 minutes, stifling debate. The timetable for discussing the Easement has slipped to November see What Next. The cost of the Charity Commission Scheme, which is a plan to consolidate the five Malvern Hills Acts into a single document and clarify and update the MHT's powers, has risen to £85,000 and the board voted to extend the budget from £100,000 to £145,000. This is on top of the cost of rebranding the Conservators as the Malvern Hills Trust. It does seem the MHT is spending an awful lot of public money on this, and one wonders exactly what the overal cost and benefit will be. Duncan Bridges CEO of the Malvern Hills Trust writes to the Malvern Gazette in response to letters of 31st August to say the MHT cannot consider planning matters. Surveyors from the Rose Farm Partnership on the common reassessing the site of the proposed Easement. Malvern Gazette publishes letters from Rosemary and Angus McCulloch, and Anne Ridley. These suggest that, although the Trust says that comments on planning cannot be accepted, MHT Board members ought to be prepared to take more responsibility any consequences of their actions, and asks why council tax payers should pay a precept to a body which does not always act transparently. The Residents' Association begins sending out invitations to MHT Board members asking if they would like to visit the sites in Chance Lane and Hall Green individually for a chat with residents. As of 15th September none had accepted. Article published in Malvern Gazette about residents' concerns about Easement sought into Hall Green Close. Video of the interview appears on Radio Hereford and Worcester Facebook page. The interview about residents' concerns broadcast on Radio Hereford and Worcester. Justyn Surrall of BBC Radio Hereford and Worcester interviews Hall Green residents. About seven residents receive letters inviting comments on a rudimentary map and suggesting the Board is almost ready to decide the application. Responses to be sent within 14 days - many people are on holiday. Board members have a site visit to look at the site of the proposed road across the common off Chance Lane, and the condition of the common following replacement of the sewer running to Mill Lane by Severn Trent. Hearsay that a developer is seeking an Easement into Rose Farm. The MHT confirms that an application had been received in 2016, but despite repeated requests, no further information is given to the public, other than it was likely to be on the south side of number 3 Chance Lane. The Board of the Malvern Hills Trust voted at a Special meeting on 19th March 2019 to refuse the application for an Easement across the common adjoining Chance Lane (11 votes for refusal, none for, one abstention). The issue leading to the formation of the resident's assocation has therefore been satisfactorily resolved, for the time being, and no further meetings are currently planned, except possibly for a social gathering later in the year. However the RA remains vigilant and would be grateful if residents would bring any concerns to their attention. During the next few months the Malvern Hills Trust will be running a public consultation about their Charity Commission Scheme and FoCoM hope to keep you informed to enable as much input from the public as possible. The Rose Farm Partnership approached the Trust in December 2016, but the documents of the application were not made available to the public on the Trust website until 12th November 2018; it appears the applicants want the MHT to sign up to a 15 year option on an easement and for the MHT to help them get planning permission. Eventually the Rose Farm Partnership would hope to sell the land to a developer and give a cut of the proceeds to the Trust. The developer, over whom the Trust would have little influence, would probably want to build two and three storey houses in the field, almost certainly several hundred, and there would be associated street lighting, and roadsigns, not to mention disturbance to wildlife and hedges; this could lead to the total urbanisation of the eastern gateway to Malvern. The vote on this is likely to be very close, so you can help greatly just by attending the meeting to show a swell of public support for refusing the application. Do please do come along if you can. The Easement will be decided with reference to the Trusts' processes so any representations should be made bearing those in mind. For example the Malvern Hills Act 1995 as amplified by the MHT Governance handbook and the Easements policy, which can be found on the MHT website.